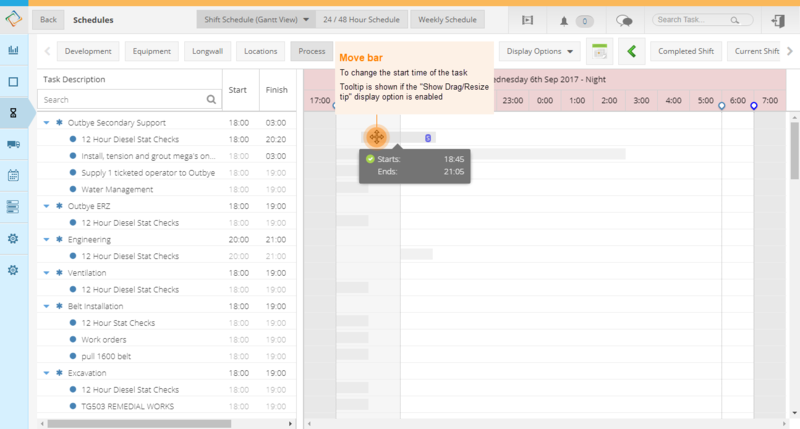 The Scheduler View shows an overview of the tasks that are in the system, for all processes, for a given scheduling range (e.g. 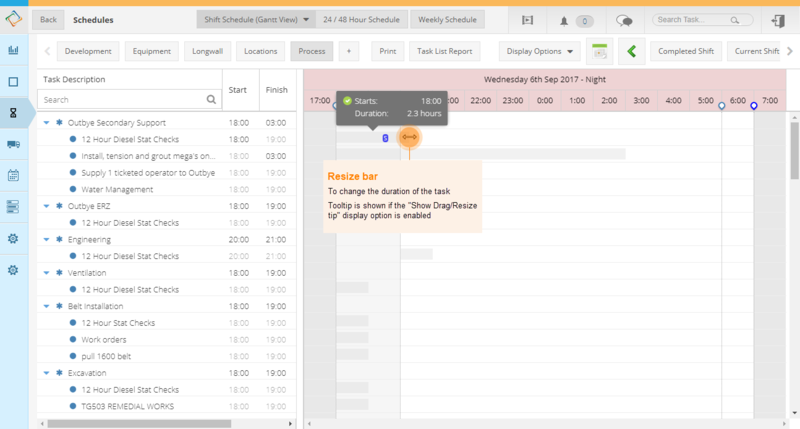 Day, 24/48 Hours, 2 Week) with the flexibility to see tasks in different angles (by Views) to create an effective schedule . It has three components: menu bar, left-hand side (resources) and right-hand side (or timeline). 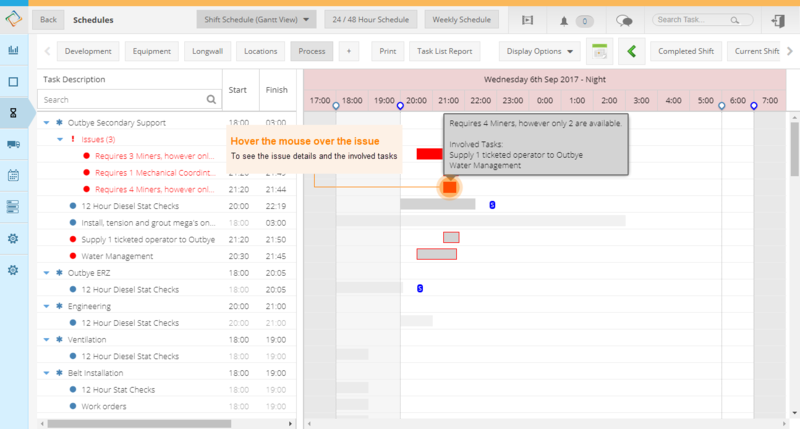 The right-hand shows the timeline with the available shifts and tasks (shown as bars). The timeline might show more than one shift times for a given shift as different processes can start at different times. 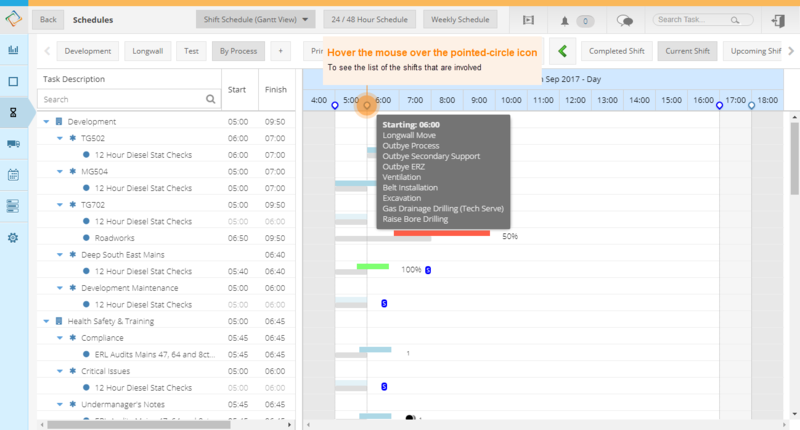 In this case, the earliest time shown is taken from the start time of the earliest starting shift plan and the time on the shifts is shown with white and light-grey backgrounds. The white background represents the majority of shifts that are currently on the screen. 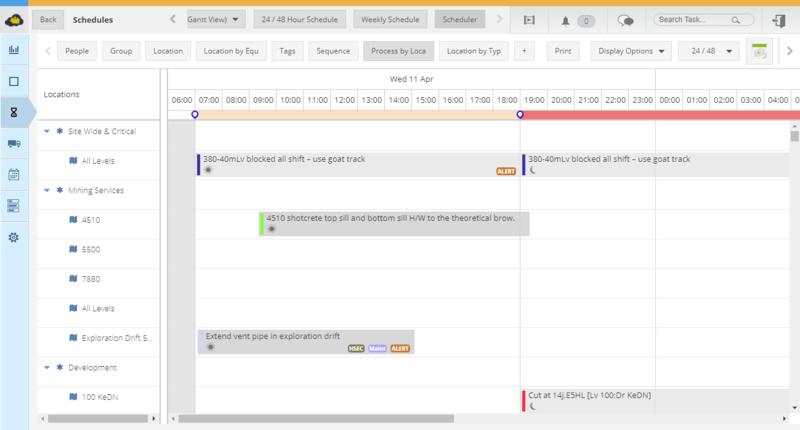 Tasks are shown as bars, representing the time that they occupy. 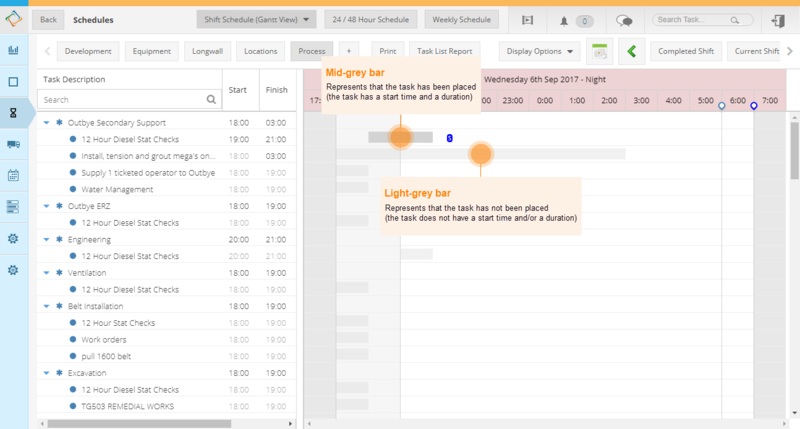 The bars are shown in different colours: light-grey for unscheduled tasks and mid-grey for scheduled tasks. Tasks that do not have a start time are positioned at the beginning of the shift. Tasks that do not have a duration are arbitrarily assigned a length of three hours. The start time and duration of a task can be changed. This can be done by people who have the "Scheduler" role. Issues are things that schedulers need to look at. Issues show up as red bars on the Issue panel that indicate the times that the issue applies. Any task involved in at least one issue will be highlighted with red borders. Assignment Issues: A known person (e.g. "John Smith") or piece of equipment ("Loader 1") is assigned to two or more tasks that overlap temporally. Because the resource could be required on any process in the shift (and even on different processes), these issues show up right at the top - they are not assigned to a given process. Requirement Issues: In any given period of time, there are insufficient resources available to service all the tasks in a process that overlap temporally. These issues only show up when the View is grouped by Process. This is because the available resources are only known at the Process level. So, for example, if the View were grouped only by tags, the tasks in a group could come from any process and it would be impossible to tell if they were short of resources. A task is planned to start or end some time outside of its shift.